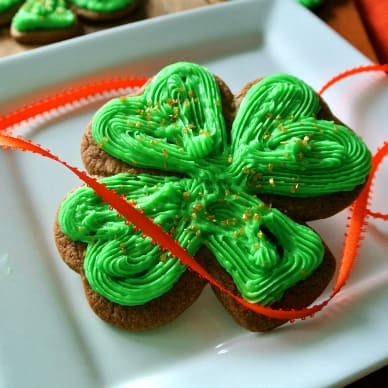 We’re getting ready to celebrate St. Patrick’s Day, and of course we had to make some cookies. 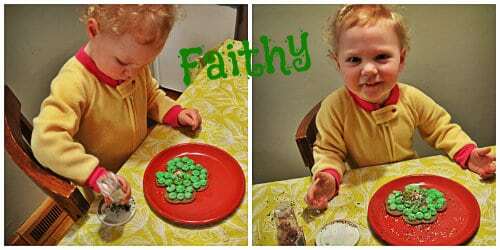 Grace And Faithy love using sprinkles (they call them sparkles) whenever they can. 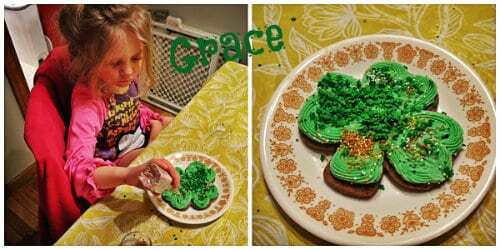 We decided to make some shamrock shaped chocolate cookies with some green mint frosting sprinkles.I took the girls to our favorite cake decorating store Bakers Nook and they picked out some beautiful gold flecked sparkles to decorate with along with the green sugar and rainbow sprinkles we had at home. I used a piping bag with a star tip to frost the cookies, and the girls went to town at decorating! It is so much fun to watch a child create their own edible masterpiece, they get really into it! In a mixing bowl, cream together the butter and powdered sugar. Mix in the egg, vanilla, and zest. Thoroughly combine. In another bowl, sift together the flour, cocoa powder, baking soda, salt, and cream of tartar. Add the dry ingredients in batches to the creamed mixture until you have combined everything well. Cover and refrigerate the dough for at least 30 minutes. This is to harden up the fat so the cookies don't spread too much. Transfer cookies to a parchment or silicone lined half sheet pan. Do no more than 6 cookies on a pan. Whip the butter until it's fluffy. Incorporate the sugar 1 cup at a time. Add the oil and whip frosting until light and fluffy. I prefer using paste food coloring. It has more vivid colors and doesn't add moisture to the dough. You can find it at a good baking store or online. Use regular food color if you like.